Antimicrobial effect, Dental caries, Lotus (Nelumbo nucifera) leaf, Oral diseases, Streptococcus mutans. The oral cavity is the first passage to the digestive tract with functions of ingesting, chewing, and sending food down to the pharynx. It also plays an important role of producing sounds and tasting food. Since it is directly exposed to the outside elements, it is invaded by microorganisms all the time. For this reason, the oral cavity creates an environment that is suitable for bacterial growth both nutritionally and physiologically, thereby providing an ideal place for many bacteria to thrive in . Overall, more than 30 species of bacteria are separated in the oral cavity, and the types and ratios of oral bacteria are constantly changing depending on each individual’s age, health status, dietary status, and hygiene status . Oral diseases refer to all diseases (e.g., dental caries, periodontal diseases, and stomatitis) that develop inside the mouth. Dental caries and periodontal diseases are major oral diseases that threaten the oral health of Korean people [3,4]. In particular, dental caries is one of the most typical oral diseases that is infectious and accompanied by tooth decay. It is a disease caused by interactions of bacteria in the biofilm on the tooth surface with food and saliva. Streptococcus mutans (S. mutans) is known as a major causative organism among the bacterial biofilm on the tooth surface . In addition to S. mutans, there are many bacteria that belong to Streptococcus sp. that can cause dental caries in the mouth. In recent years, the development of antimicrobial substances using natural products (e.g., Nelumbo nucifera, Phellodendri cortex, magnolia bark, and aloe) has been reported [5-8]. Among the natural products used, the antimicrobial effect of the Nelumbo nucifera leaf extract has been reportedly limited to food-related microorganisms . However, its effect on bacteria related to dental caries has not been examined at all. Therefore, in this study, the antimicrobial effect of the Nelumbo nucifera leaf extract on oral disease-inducing bacteria was investigated for nine types of Streptococcus strains, including Fusobacterium nucleatum, which is highly related to oral diseases. For this experiment, 500 g of dried Nelumbo nucifera leaf grown in Yeongcheon, Gyeongbuk, South Korea was purchased from Busan Hyundai Pharm Co., Ltd. After adding 70% methanol 10 times to 100 g of crushed Nelumbo nucifera leaf, the extraction was done in a heating mantle at 65°C for 3 h. The extract was filtered 3 times by using filter paper (Advantec No. 2, Toyo, Japan), and the Nelumbo nucifera leaf extract was concentrated and lyophilized by using a rotary vacuum evaporator (N-N series, EYELA Co., Japan), an aspirator (A-3S, EYELA Co., Japan), and a freeze dryer (Ilshin Lab. Co., Korea). The lyophilized sample was dissolved in 10% dimethyl sulfoxide (DMSO) and stored at -20°C after dilution. The strains used in this experiment were purchased from the Department of Biology at Yonsei University (Table 1) and they were used for the experiment after the subculture in the culture broth, which was anaerobically incubated in the brain-heart infusion (BHI) broth at 37°C for 24 h.
Table 1. List of microbial strains used for antimicrobial activity. The antimicrobial activity of Nelumbo nucifera leaf extract was measured by using the paper disk agar method . One loop of each of the nine experimental strains was inoculated into 10 ml BHI broth and anaerobically incubated at 37°C for 24 h. First, 15 ml of the sterilized BHI medium was dispensed into a petri dish and solidified, and then the culture broth of each strain was uniformly smeared with a sterilized cotton swab. Meanwhile, the Nelumbo nucifera leaf extract was completely dissolved in 10% DMSO and diluted to make a maximum concentration of 10 mg/ml. The 50 μl diluted extract at each concentration was absorbed in a paper disk (Φ 8 mm), and then the disk was dried. The dried disk was placed on the surface of the test plate media, adhered, and anaerobically incubated at 37°C for 24 h. The clear zone (mm) around the paper disk was measured in order to examine the antimicrobial activity of the extract. In order to measure the minimal inhibitory concentration (MIC), the broth dilution method  was used. Each sample strain was inoculated into a BHI broth (10 ml) and anaerobically incubated at 37°C for 24 h. Then, 50 μl of each cultured strain (1 × 107 CFU/ml) was inoculated into a 96- microwell plate containing the Nelumbo nucifera leaf extract at each concentration (0 mg/ml, 2.125 mg/ml, 4.25 mg/ml, 8.5 mg/ml, 17 mg/ml, and 34 mg/ml). This microwell plate was anaerobically incubated at 37°C for 24 h, and then the absorbance (OD) was measured at an absorption wavelength of 490 nm with an ELISA reader in order to evaluate the antimicrobial effect of the Nelumbo nucifera leaf extract. Herein, the minimum concentration of the sample, in which the growth of each strain has not been observed, was defined as the MIC. The antimicrobial effect of Nelumbo nucifera leaf extract on each oral bacteria that was examined by measuring the clear zone via the paper disk method is presented in Table 2. The clear zone of S. mutans was found to be 1.25 mm and 2 mm at 5 mg/ml and at 10 mg/ml, respectively. The clear zone of S. gordonii was 2 mm at 10 mg/ml, while the clear zone of S. sanguinis was 1.5 mm, 2 mm, and 4.5 mm at 2.5 mg/ml, 5 mg/ml, and 10 mg/ml, respectively. The clear zone of S. sobrinus was found to be 1.5 mm and 5.5 mm at 5 mg/ml and 10 mg/ml, respectively, while the clear zone of S. ratti was 1.5 mm and 2 mm at 5 mg/ml and 10 mg/ml, respectively. The clear zone of S. anginosus was 7 mm, 9 mm, and 11 mm at 2.5 mg/ml, 5 mg/ml, and 10 mg/ml, respectively, thereby showing the highest antimicrobial effect. The clear zones of S. criceti and S. oralis were 2.5 mm and 1.5 mm at 10 mg/ml, respectively, while the clear zone of Fusobacterium nucleatum was 6 mm, 7.5 mm, and 10.5 mm at 2.5 mg/ml, 5 mg/ml, and 10 mg/ml, respectively. Table 2. Antibacterial activity of 70% methanol extract of Nelumbo nucifera via paper disk method. Therefore, the methanol extract of Nelumbo nucifera leaf showed the strongest antimicrobial activity against S. anginosus and F. nucleatum, and the weakest activity against S. oralis and S. gordonii (Figures 1 and 2). Methanol extract was absorbed into the paper disk (Φ 8 mm) and the diameter (mm) of the clear zone was measured. Figure 1. 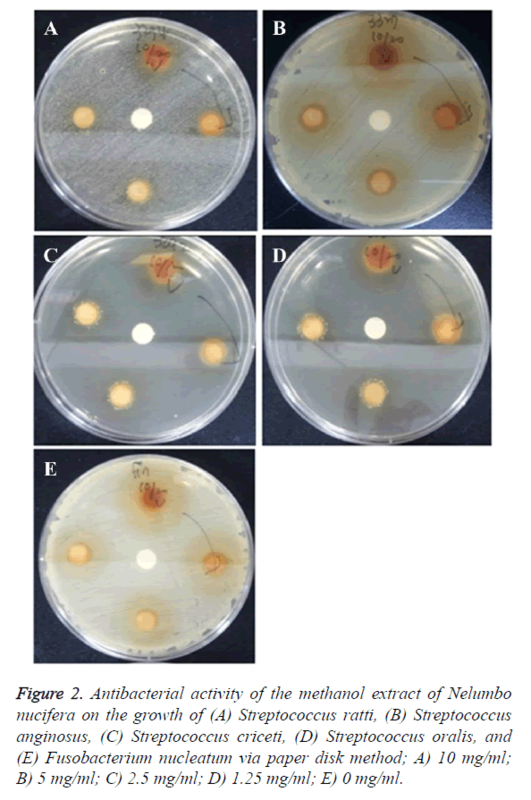 Antibacterial activity of the methanol extract of Nelumbo nucifera on the growth of (A) Streptococcus mutans, (B) Streptococcus gordonii, (C) Streptococcus sanguinis, and (D) Streptococcus sobrinus via paper disk method; A) 10 mg/ml; B) 5 mg/ml; C) 2.5 mg/ml; D) 1.25 mg/ml. Figure 2. Antibacterial activity of the methanol extract of Nelumbo nucifera on the growth of (A) Streptococcus ratti, (B) Streptococcus anginosus, (C) Streptococcus criceti, (D) Streptococcus oralis, and (E) Fusobacterium nucleatum via paper disk method; A) 10 mg/ml; B) 5 mg/ml; C) 2.5 mg/ml; D) 1.25 mg/ml; E) 0 mg/ml. The antimicrobial effect of Nelumbo nucifera leaf extract on each strain that was measured with the MIC is presented in Table 3. The MIC of the extract against S. anginosus was 2.13 mg/ml, which was the strongest antimicrobial activity, while the MIC against S. sanguinis, S. sobrinus, and F. nucleatum was 4.25 mg/ml, respectively, and the MIC against S. mutans, S. gordonii, S. criceti, S. ratti, and S. oralis was 8.5 mg/ml, respectively. The result of the antimicrobial activity that was measured with the MIC was nearly consistent with the result of the antimicrobial activity that was measured via the paper disk method in that the antimicrobial activity against S. anginosus was the strongest, while the antimicrobial activity against S. gordonii was the weakest. Table 3. Minimum inhibitory concentrations of 70% methanol extract Nelumbo nucifera. The oral cavity is one of the parts of the body where oral diseases and systemic diseases are frequently caused by pathogenic infectious strains and resident flora by providing a remarkably easy environment for various microorganisms to thrive in . Methods for oral health improvement by controlling the growth conditions of the oral microorganisms have been diversely studied and developed. The misuse and abuse of drugs and the drug resistance to nosocomial pathogens have recently become serious problems; therefore, the need for new alternative drugs is becoming apparent . As a result, there is a recent growing interest in studies on the inhibition of oral diseases using natural products without side effects . Natural products have been used in folk remedies for thousands of years, and there is a growing interest in the development of natural antimicrobials and physical health as of late [13,14]. The purpose of this study was to investigate the effect of the methanol extract of Nelumbo nucifera leaf, which is a natural product, on oral bacteria. The antimicrobial activity against oral bacteria was confirmed by treating nine types of strains with the methanol extract of Nelumbo nucifera leaf. In terms of the MIC against S. mutans using a natural product, the MIC of gold was 125 mg/ml in the study of Paek et al. , the MIC of Schisandra chinensis was 50.0 mg/ml in the study of Chung et al. , and the MIC of cassia seed was 5.0 mg/ml in the study of Na et al. . Since the MIC of Nelumbo nucifera leaf extract is 8.5 mg/ml against S. mutans, its antimicrobial effect is considered to be relatively strong, as compared to those of the other natural products. This result was similar to that of the study showing that the MIC of Nelumbo nucifera leaf extract against S. mutans, F. nucleatum, and A. actinomycetemcomitans was as low as 625 μg/mL, thereby demonstrating the superiority of Nelumbo nucifera leaf extract with regard to its antimicrobial effect . Based on these results, it has been confirmed that the methanol extract of Nelumbo nucifera leaf has an excellent antimicrobial effect against many dental caries-causing bacteria, and it can be developed as a highly stable and natural agent for dental caries prevention. Nelumbo nucifera leaf extract showed an excellent antimicrobial activity against dental caries-causing bacteria. Therefore, it is considered as an effective agent for the prevention of dental caries and it can be used as an alternative for the existing chemical agents. It is believed that Nelumbo nucifera leaf extract can be used effectively in the prevention of oral diseases (e.g., dental caries), and ultimately contribute to the improvement of oral health promotion in the future. Paek JY, Kim YH, Kwon HJ, Kim EN, Kim WJ, Han MD. Effects of antibacterial and adhesive inhibition of scutellaria baicalensis extract on streptococcus mutans. J Dent Hyg Sci 2008; 8: 367-373. Cha JD, Jeong MR, Jeong SI, Lee KY. Antibacterial acitivity of sophoraflavanone G isolated from the roots of Sophora flavescens. J Microbiol Biotechnol 2007; 17: 858-864. Mosci F, Perito S, Bassa S, Capuano A, Marconi PF. The role of Streptococcus mutans in human caries. Minerva Stomatol 1990; 39: 413-429. Park CS, Shin YS, Ryu IW, Lee KS. Antimicrobial activity of extracts from aloevera peel against Streptococcus mutans JC-2 (I). Korean J Food Nutr 2000; 13: 139-145. Pearson RD, Steigbigel RT, Davis HT, Chapman SW. Method for reliable determination of minimal lethal antibiotic concentrations. Antimicrob Agents Chemother 1980; 18: 699-708. Lee SY, Kim JG, Baik BJ, Yang YM, Lee KY, Lee YH, Kim MA. Antimicrobial effect of essential oils on oral bacteria. J Korean Acad Pediatr Dent 2009; 36: 1-11. Yanaida A, Kanda T, Tanabe M, Matsudaira F, Oliveira Cordeiro JG. Inhibitory effects of apple polyphenols and related compounds on cariogenic factors of mutans streptococci. J Agric Food Chem 2000; 48: 5666-5671. Ahn ES, Kim JH, Shin DH. A Study on the antimicrobial activity of volatile allyl iosothiocyanate compounds. Korean J Food Sci Technol 1999; 31: 206-211. Paek JY, Kim YH, Kwon HJ, Kim EN, Kim WJ, Han MD. Effects of antibacterial and adhesive inhibition of scutellaria baicalensis extract on streptococcus mutans. J Dent Hyg Sci 2008; 8; 367-373. Na GM, Han HS, Ye SH, Kim HK. Extraction characteristics and antimicrobial activity of Cassia tora L extract. J Korean Soc Food Cult 2004; 19; 499-505. Lee ES, Han YS. Anti Oralmicrobial Activity of Various Extracts from Parts of Lotus (Nelumbo nucifera). Korean J Food Cook Sci 2011; 27: 1-9.